Thanks, Ricardo. The situation’s a lot less complicated now! So we went and saw Crimson Peak. It’s a very pretty movie with some great period costumes, sets, and cinematography! It’s also kind of boring with very little in the way of legitimate scares, and a plot that doesn’t offer much in the way of twists. The trailer is also somewhat misleading, making it seem like more like a ‘Haunted House‘ scenario than it is in actuality. Granted, Guillermo del Toro kept selling it as a ‘Victorian gothic love story’ more than a straight up horror movie. But considering there’s not much emphasis on the romance after the first quarter of the film, I’m pretty sure it’s just a lackluster horror movie! I still love del Toro, though. I just wish he’d gone with his more bombastic style on this one! Yeah, it might have been good to do this earlier. I guess the Wataro ambassador wasn’t as effective as Nataku in the “obviously could kill you once you have no gun” kind of way. Yeah but Genchu has started thinking about killing him before he does the deal. There are plenty of reasons to sell guns to pacifists! To begin with, you can use guns to shoot down asteroids that are threatening our planet. There are other uses for weapons when fighting against environment as well, such as shooting volcanoes, fires, earthquakes and tsunamis. … well, ok, explosives work a little better. Nukes might also work. Other than that, you can use guns during historical reenactments. A very important event for pacifists, as it clearly shows why militarism is evil. And don’t forget pacifists know how to turn guns into farming implements and other useful objects! … oh, and don’t forget zombie apocalypses. During those, even pacifists take out their shotguns and chainsaws. Now I’m picturing Ricardo shooting down an asteroid. Or maybe mount Fuji, if that ninja ever manages to toss it. Last panel. Never doubt Bunzo! I’m picturing a NN4B zombie apocalypse. Pacifists buy guys….. to keep the warmongers in line of course. Doesn’t work, Xinef. Someone ALWAYS makes more guns. Just offer better payment than rebels? To the point, the rebels will sell you all the guns they already have? Will not work if the rebels already robbed your banks. Also some citizens might rebel because of wasteful government expenditure. Then there is the coup problem. Well armed citizens might be the deterrent which checks the generals in your expensive army. This is exactly why the AK-47 was invented. Well not exactly why, but it being very reliable and cheap + easy to make doesn’t hurt its popularity. Only way to avoid a rebel victory 100% of the time: Never use policies likely to induce rebellion in the first place and keep a steady eye out for corruption. Aka, actually be a government. They’ll just start using tools, cerca nunchucks, sai, hammer etc. What? Ricardo’s actually listening to reason? If the priest wasn’t standing right there, I’d think he put on a Ricardo suit and wig and took his place. I think this comment demands an illustration, Alex! He fights with muskets and with spears. …Really, if he manages to find them, I think Ricardo’s best deal would be with the ninjas. They do have the funds, they live up to their arrangements and they are a neutral party to the political scenario so nobody would be angry at you for your sale. The point is that he wouldn’t be playing favorites. Ninjas are mercenary forces. If someone points them at your direction you will be angry at either the ninjas or their contractors. Not at some random Portuguese merchant that was doing his job. Contrast what any clan would do. “A foreigner brought to Japan a form of weaponry that will change warfare as we know it and we are the first to have it. Surrender/cease your attacks and your clan will not be the first one to fall to its great power.” At that point you become mad at Ricardo for beneffiting from the political landscape in a way that clearly screwes you over. Not to mention that discretion is the 101 of a ninja’s job. Nobody would know who the supplier is until his next, vastly better equipped travel, in which buying the weaponry is a better use of the time than pursuing vendettas. Looking at Rrricarrdo’s personality though, he’s more likely to choose the “I’ll just shoot anyone who threatens me” path. Or at least point his gun at them until they buy it from him. Despite Ricardo’s eccentricities I doubt he would sell a gun to anyone he thinks would shoot him in the back. They are also actually reasonably chill, so your chances of not dying are probably a lot better. Nataku might be regretting right now that he took German in high school instead of Portuguese. 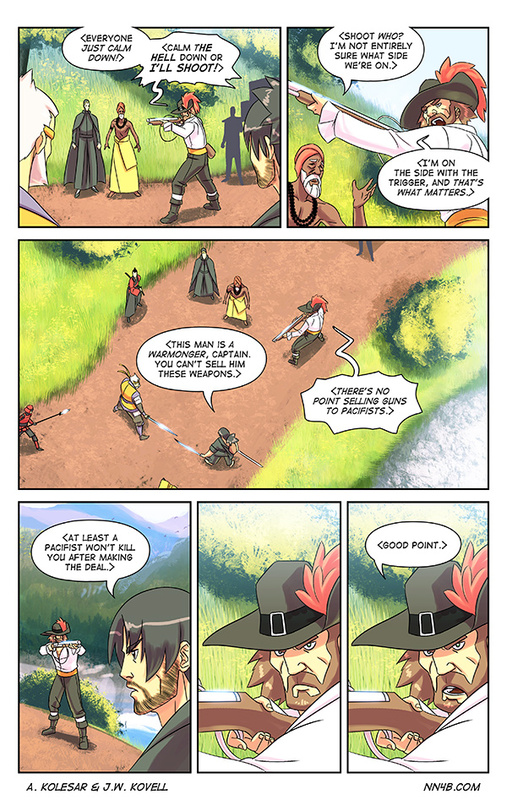 All this talk of pacifism in the comic! time to listen some hippy music!!! Oh nooooes!!! I caught up with the comic. Was great entertainment. Thank you. I will check back for updates. One shot and it might miss or do very little damage… and then there’s the other guy to deal with. Yay for misplaced bravery. 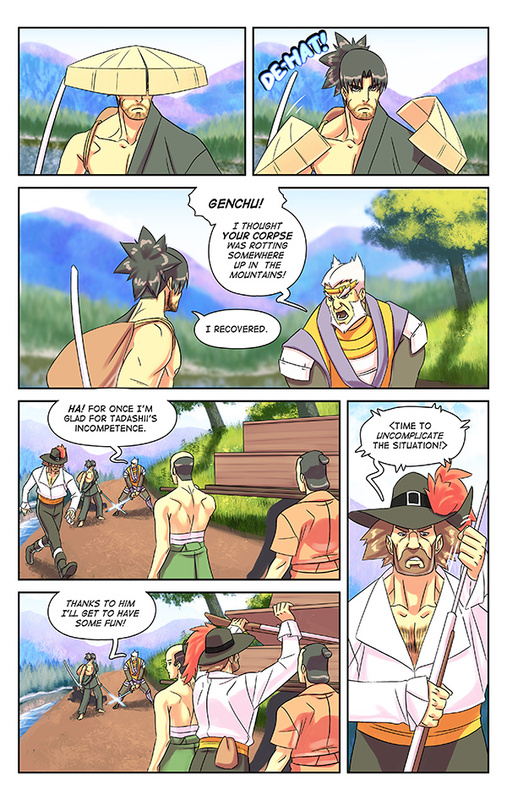 Good job Genju. Do the language thing! It’s actually a really good advantage.